This little kitchen hack is so easy . . .
Rich in immune-boosting lauric, bone building phosphorous and soothing magnesium, coconut milk is one of my favorite kitchen ingredients. 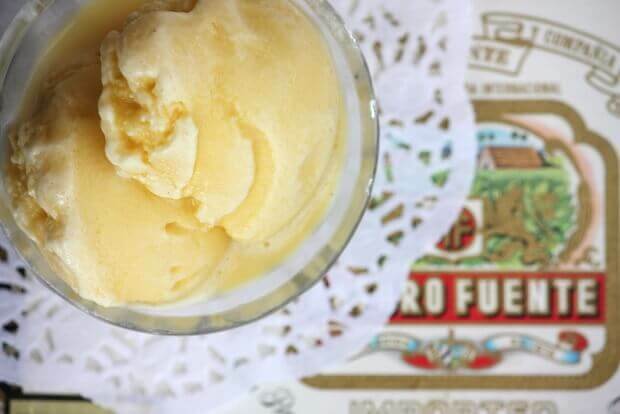 I especially love it in soft-serve ice cream, coconut creme brulee, raspberry custard tartlets, fudge pudding pops, though it makes a fantastic base for dairy-free shrimp chowder, too. Why not just buy the canned stuff? Manufacturers can slap on the “BPA-Free” label even if their products still contain toxic bisphenol. You can read more about that here. Canned coconut milk often contains thickeners like guar gum and xanthan gum, which can cause digestive problems in some people. Xanthan gum in particular can be problematic for people sensitive to corn, soy, dairy, or wheat, since it is a product of bacterial fermentation that is often grown on those mediums. Personally, I’ve noticed that my stomach feels a little “off” after consuming coconut milk that contains guar or xanthan gum, so I prefer additive-free. There are two brands that I know of that do not have any thickeners or additives, and they come in BPA-free packaging. Does that mean they don’t contain bisphenol? Not necessarily, but they are my “go to” options if I’m using pre-made. Find them here and here. Really, though, this method is so quick and easy that I don’t even consider pre-made unless I can’t get coconut cream. Pour coconut cream and water into a blender and mix until smooth. An immersion blender works, too! Optional step: If you're using the coconut milk for baking, the above steps should be sufficient. However, if you're drinking it and want a smoother texture, allow the coconut milk to thicken and then strain it through cheesecloth before serving. Stir coconut cream into hot water until dissolved. 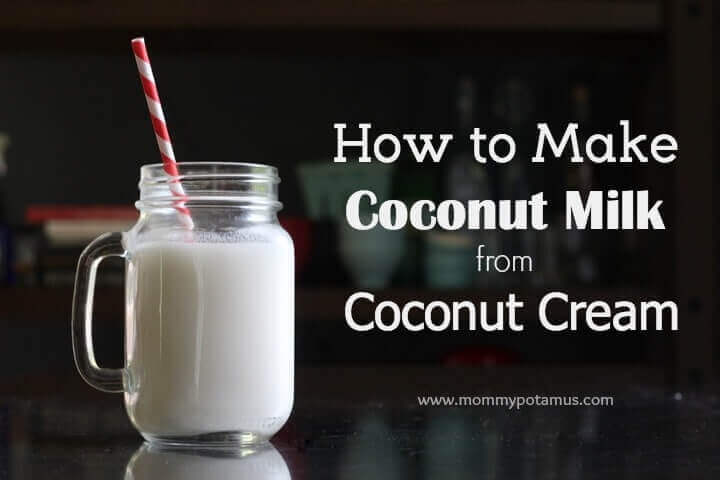 * Keep in mind that this recipe thickens naturally about 20-30 minutes after it is mixed up, so if you think it's too thin you may want to wait until then before adding more coconut cream. Where do you buy concentrated coconut cream? The link in the recipe shows a few kinds of coconut butters, but no cream. Just curious. My 20 mo old can’t have dairy and I have tried all kinds of coconut milk, my fav thus far: pureeing shredded coconut with hot water, but none of these seem to interest his palate. I can cook with it, no problem, but I just wish I could find an actual “milk” he would drink. He pines after his big brothers raw cow’s milk and it breaks my heart. Sarah, coconut cream is also known as coconut butter. Heather likes to use Artisana coconut butter. Can’t have, or won’t have? Coconut cream and coconut butter are not the same thing. I use both and they are very different. Coconut cream is the consistency of dairy cream and very white. It will thicken once opened. Keep it in a mason jar in the fridge. Coconut butter is a solid at room temperature and off white. Have you tried hemp milk? I personally think it’s close to the flavor of cow’s milk… not as much protein however. My husband buys coconut cream at Trader Joe’s (it’s in a can :-(, but it’s very good). He uses it to make fudge and it’s delicious. You might try it to see what you think. Theirs still has the emulsifier in it. Not the “low fat” version. Tropical Traditions sells it in a glass jar. My children drank raw goats milk. You can find a farm who will sell it to you or, several health food stores sell it. I put 1/2 and 1/2 raw carrot n juice. This is quite well-liked. Goat milk has smaller globules and is more easily digested. Closed to human milk. Larissa, coconut cream is also known as coconut butter. Heather likes to use Artisana coconut butter. Would refrigerating this produce a nice thick layer of cream on top? Like that in the canned milk? Does this have a gritty feel at all? Or does it taste similar to coconut milk made from shredded coconut? 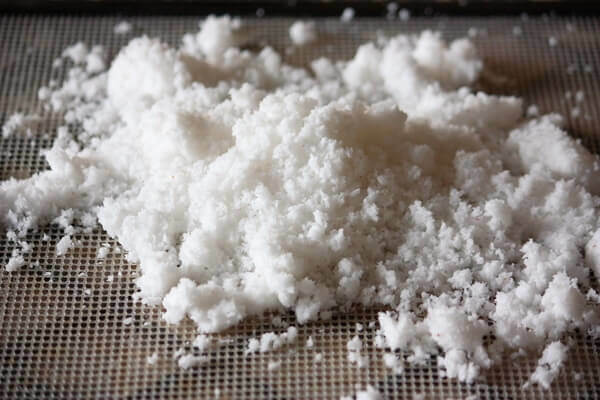 I haven’t found a way to make it not gritty, so while I use this kind for cooking recipes, for drinking I blend the shredded organic coconut with hot water and strain. It’s the best I’ve ever had, and the taste can’t be beat. I was really hopeful for the coconut manna to work but it’s just too gritty and much more work to make it smooth by straining. Also, do you know how the nutritional value compares to homemade from shredded coconut? Similar fat content and nutrients? Can you make ice cream with it? Thank you, Heather! This looks great. I’m never going to buy the canned stuff again! I just wanted to point this out because I was curious if this method would save me money or not. I am not sure if my math is correct or not, but this method is expensive if made with the coconut butter she cites at $13.85 compared to the almond breeze I purchase at the grocery store for about $4.00. The premade comes in half a gallon, which has 8 cups, so each cup (8oz) is $0.50. Contrast that with the 16 oz jar of coconut butter, which, to make milk requires 1/4 cup to make 1 cup of milk, and makes 8 cups (half a gallon) total of milk. With this recipe that $13.85 become $1.73 per cup of milk while premade is only $0.50 per cup. Just in case anyone else was curious…..
Hi Goldi, I didn’t realize Almond Breeze made 100% coconut milk. I know of their blends, but I was unable to find a listing for a product that didn’t also include almond milk – can you help me out? Regarding the price, yes it is about $1.73 per cup. I will say, though, that you could easily use half the coconut butter and still get decent coconut milk. I just prefer for mine to be nice and thick. The additive free pre-made stuff I link to in the post is about $2.75 per 8 oz., so this recipe would save money for those who are buying those brands. Oh, please. Almond Breeze contains additives and synthetic vitamins. I would rather spend more money to make a quality homemade, additive free and healthier product. You can make your own coconut butter with coconut flakes and a vitamix. Takes only a minute or two and is significantly cheaper than the bottled stuff. You tried this I take it. Do you use hot water? You can also make it in a food processor. No water required. Just empty 1 – 2 cups of the small coconut flakes into your blender or food processor and process until it’s the consistency you like. The coconut flakes whip up into a nice creamy butter with nothing else added. I pay $2.19 for an 8 oz bag from Vitacost. I’m already doing homemade almond milk, def doing this. I just bought a can and I hate to do so because of the additives or junk they can add. I guess that will be my last can. Thanks!!!! I’ve been using the powdered or canned coconut milk for convenience. 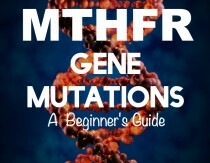 After reading this, I’ll revert back to the original – a bit messier, more work, but certainly healthier. Thanks for sharing. I’ve tried make this with Tropical Traditions Coconut Cream Concentrate and the Artisans Coconut Butter. Both of these coconut milks turned up gritty or pulpy. I tried to strain it with cheese cloth and that took all the white out of the milk. I prefer a smoother coconut milk so I haven’t made anymore with the butters. I’m so sorry to hear that, Susan! I often use Artisana and it’s not gritty at all . . . I wonder if it maybe it has something to do with differences between batches. Thanks for your feedback – I’ll look into it. I’ve had the same gritty results when trying to use Tropical Traditions. Hi Heather. I’m new to making coconut milk. I bought some artisana butter and tried diluting it with warm water but it only kind of melted the oil and didn’t thicken it to a creamy thick milk as I’d been hoping. What have I done wrong? I used a round tsp of coconut butter to a tablespoon of water? now what I will do with this butter? When making coconut milk from coconut cream concentrate, it will be gritty because there is fiber from the coconut. The Tropical Traditions website has that disclaimer on their recipe page. They do, however, have a lot (like over 100) of recipes for other things that you can make with the coconut cream. I still like the coconut milk even with the graininess, so thanks, Heather! I guess some of us are less sensitive. I also use it when making curry, and other Indian or Thai dishes. Your hair loves and needs it. Try it. Maybe this is the new use for it. I also bought from Tropical traditions the coconut cream aka coconut butter. It is the coconut’s version of peanut butter. I can see how it would not be good for making coconut cream. I bought a small carton of another brand and it was smooth and more like the top of the can of coconut, ie the cream on the top. So I think some is the fat part of the coconut milk without the other liquidy part and some is actually coconut butter, depending on the interpretation of the company making or selling it. I just made this with the Artisiana and it was out of this world tasty good! Slurped it right down. I wizzed up another batch and put in the fridge to chill so that next time I can add some frozen raspberries and make a creamy afternoon frozen smoothie treat! Bet it would also make great popcycles too! Oh, my oh my! THAT could happen here in my kitchen…. So glad it worked well for you, Aly! Hi! Is coconut cream the same thing as raw coconut? My health food store sells Nature’s Way brand raw coconut, but is this the same? Or do I need to find a jar that says coconut cream/butter? Artisana, Nutiva, and Dastony all make nice raw organic coconut butters. I have been making coconut milk with the shredded and hot water. My 16 month old loves it. Only issue is it doesn’t yield much, and it seems this recipe yields even less. Would like to be able to make more in a batch so we can all drink it and not have to make it every day. Any tips for larger batches? Hi! Thank you for this recipe. Can the coconut milk this recipe generates be used to make coconut milk? My son is sensitive to guar and xantham gum so I want to make our own coconut milk and coconut milk yogurt, but would love to use coconut butter as a base instead of real coconuts just for ease 🙂 Thanks! Have you every tried the small cartons of Let’s Do Organic Creamed Coconut? No bad stuff in them and pretty cost effective. You can order a case of six cartons via Amazon for under $14.00. The recipe you have for coconut milk requires 3/4 c. water to 2 tbsp of the cream/butter which turns out to be quite economical compared to buying the canned milk. My son also makes a fabulous shampoo out of 1/3 cup Dr. Bronners liquid soap, 1/4 c. coconut milk, and 1 tsp nut oil (he uses walnut). It lathers beautifully and is very pure for those who are looking for a clean shampoo. I LOVE “Let’s do organic ” coconut cream products . Thank you for the hair shampoo recipe, can’t wait to try it!!! Thank you for this recipe! I tried it, it did not work out well, though. It took me 15 minutes to scrape out the coconut cream. I added it to the amount of water as said, but it was waaay to thin and runny. How did you get out the coconut cream? Mine is pretty much rock hard without being in the fridge! Can you tell me what to do differently? Just thought I’d mention that the Golden Star brand of canned coconut milk contains only coconut milk and water and is in bpa free packaging. It’s 1.48 at Walmart for 13.5 oz. For those who need something pre-made. $1.48 per can? Walmart site says $3.03. Thanks for the info! I wanted to make some Coconut Tapioca cookies (Kanom Ping), but I didn’t have any coconut milk–but I did have a jar of Nutiva Coconut Butter than I use in my smoothies. A Google search led me here, and presto! I had a cup of “coconut milk”! It worked really well in the recipe! I bought Coconut Cream Concentrate from Traditions and have a recipe for coconut yogurt with coconut cream. How do I make it from concentrate. I also have Nature forest coconut milk simple (without guar gum) I want to make it with what I have. I was wondering if this is considered full fat coconut milk? I’m making coconut yogurt in my instant pot and was wondering if I could use this recipe instead of canned full fat coconut milk? Thank you so much for sharing, it tastes delicious! would this be equivalent to full fat or light coconut milk? I have canned coconut cream and would love to use this for recipes that call for full fat coconut milk, and want to make sure 3/4 c water isn’t making it too low in fat. Look forward to your insight. I have this same question! 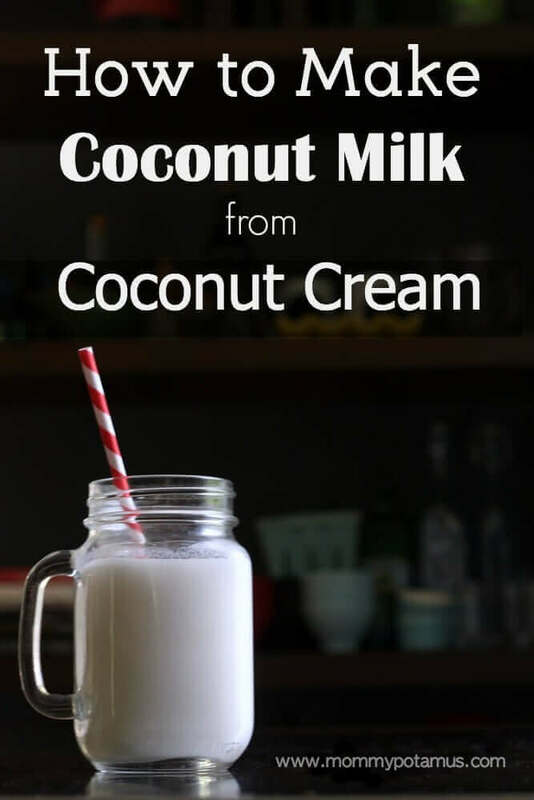 I’m not sure if the recipe is equivalent more to a canned coconut milk or a beverage coconut milk? Thank you for the really simple recipe! I steer away from recipes with coconut milk simply because of the additives which seem extreme. 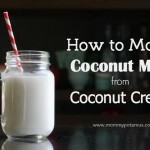 I was able to source creamed coconut from Blue Dragon – sold at Sainsburys & just happened to google to find out if it can be made into milk which brought me to your site. I can now make all the Thai curries etc that I’ve been avoiding. I have read that the solution to the grittiness problem is to strain the milk through cheesecloth. how much % fat does the cream has to be? I was wondering if you have ever made coconut whipped cream from the hard fat the thickens on top of homemade coconut milk. It is very firm and I can’t figure out how to whip it. Thanks for your help. I am unable to find any information on the internet.